The Eagle's Moon is a beautiful example of traditional First Nations art and design, by renowned artist Roy Henry Vickers, whose art is featured in the stunning Eagle Aerie Gallery in Tofino. His signature Eagle Moon design appears superimposed on many of his beautiful images and remains his trademark symbol. These Eagle's Moon Medallions are chocolate celebrations of Roy Henry Vickers' incredible talent! 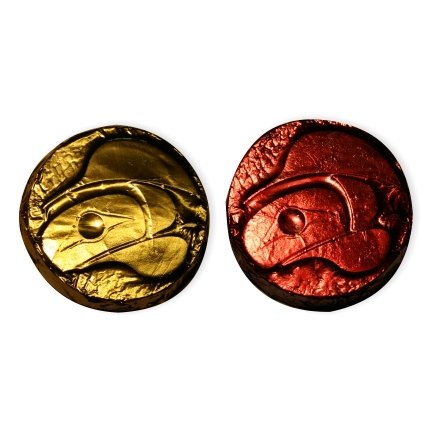 Each 1.75" solid chocolate medallion is individually wrapped in foil, available in Milk or Dark Chocolate.